2 pcs polka dot paper garland . 6 pcs tissue paper pom poms flowers .3 * 8 inch tissue paper flowers, 3 * 10 inch tissue paper flowers. 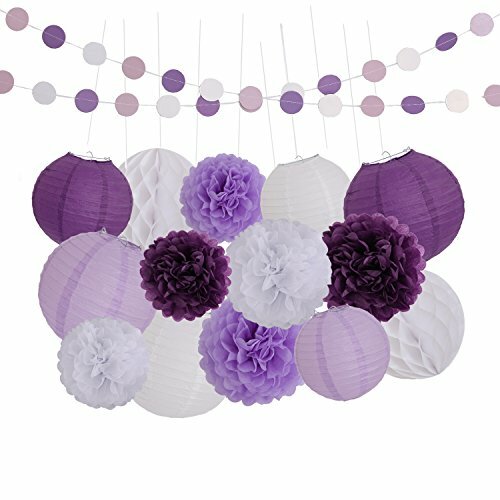 3 * 8 inch tissue paper lantern, 3 * 10 inch tissue paper lantern,2*10 inch honeycomb balls.2 pcs polka dot paper garland string is 6.5 feet long. How to operation the Paper Flower? 1. You have a long strip of tissue paper in front of you that does not yet look anything like the paper flower on the package. The paper flower on the package,Don't worry ,It's so easy! 2. Unfold the tissue paper to the outside with the edges. 3. Carefully pull the layers of tissue paper apart one by one. Tissue paper is so thin that can therefore tear easily. But be easy,The strips of tissue paper are joined together in the finished paper flower. 4. When all the strips have been pulled apart, the paper flower has become slightly oval, you should create a more rounded shape with your hand gently. Done! We sincerely wish our decorations will light your party let you have a happy party. Please feel free to contact us if you have any questions. >Using Occasion: Great for celebration , birthday party,baby shower, wedding ,holiday, family part.home decorations. any age, gender, and party theme. >Package contents: 6 pcs tissue paper lanterns,2 pcs honeycomb balls, 6 pcs tissue paper pom poms flowers, 2 pcs polka dot paper garland .Total 16pcs. >Paper flowers easy to assemble with simple instructions, you can refer the instructions to assemble step by step. If you have any questions about this product by LyButty, contact us by completing and submitting the form below. If you are looking for a specif part number, please include it with your message.